Do you need to prepare a meal for a large group of people? 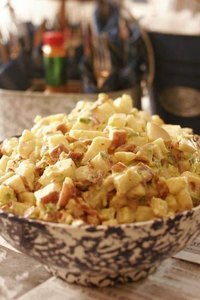 What better way then to do it with this simple, tangy potato salad recipe. Within an hour, you will have whipped up a timely favorite that all of your guest will enjoy! Combine the potatoes, bacon and eggs in a large bowl. Combine the dip, relish, salt and pepper in a small bowl. Mix the small bowl of sauce into the large bowl of potatoes, bacon and eggs. Serve in a lettuce-lined bowl, if desired.